Poor streetcar. You’re sleek, you’re shiny, you’re new and apparently no one likes you. Not only that, but now all those who questioned you from the beginning are saying you’ll always be a complete failure. Last week the AJC reported two pieces of bad news for the Atlanta streetcar: the cost of operation will be roughly 50% greater than expected and the initial ridership numbers are 18% below expectations. A government project, or any project for that matter, costing more than expected isn’t too shocking, but coupled with the disappointing ridership numbers this story is ripe for political and ideological debate. Accordingly, it has taken little time for streetcar doubters to call boondoggle on the project and take victory laps. So the streetcar was a waste of money and needs a complete transformation to make it popular, right? Of course not. It’s already pretty popular and its already providing a great economic return. While the set of numbers used in the article don’t paint a rosy picture, we need to understand that 1.) the numbers presented in the AJC report aren’t all that accurate; and 2.) we’re only two months into a project that already has and will continue to produce long-term economic development. Numbers and stats are fun things. They can be manipulated, either purposefully or inadvertently, to show or create an idea. I recently ran some data and made some graphs that show that crime rates on MARTA are really very low. The data I used is just one set of numbers. I could have compared the rates to other systems around the country, which is something I would like to do, and come to the conclusion that crime on MARTA is actually fairly high in comparison, which would have painted a different picture. It could be, I don’t know, I didn’t choose to present that data at the time. Conclusions based on data should always be questioned; not necessarily because the conclusions are wrong, but perhaps because they aren’t painting the entire picture. In this case, the numbers really don’t paint the entire picture. In response to the AJC article showing ridership numbers down 18% and the subsequent parade of hate for the streetcar, Michael Geisler, the chief operating officer of the Atlanta Streetcar, wrote an opinion piece presenting a different set of numbers. Both sets of numbers should used when making any evaluation, but after seeing both and learning about the background for the ridership projections, reporting only the 18% figure seems a bit irresponsible. Mr. Geisler points out that the numbers used in the report reflect an incredibly short period of time and could be calculated in a number of different ways that could produce a number of different conclusions. First off, the Atlanta streetcar saw 100,000 riders in the first eight weeks of service. The projected ridership for the streetcar is 2,600 a week over a 12-month period. Critical to this calculation is that it only includes weekdays, not weekends. The report in the AJC simply used the total ridership numbers for a 48 day period and divided by 48. This resulted in a number that was 18% below projections. The problem, of course, is that the number should be 34 and not 48, since the official projections only count weekdays. Using this calculation, the streetcar actually saw 13,600 more riders than projected. It’s important that we’re only using weekday numbers when we consider the route of the streetcar. The route was designed with tourism in mind; it attempts to hit the major Atlanta landmarks in its run from Centennial Olympic Park to the King Historic District (or Edgewood-Aurburn area). Other than tourists, the streetcar is hoping to get ridership from downtown workers, Georgia State Students, and residents that live in and around Edgewood and Auburn Avenues. Well, the number of downtown workers and students falls dramatically on the weekends. Coupled with the fact that the Edgewood-Auburn area, alone, likely lacks the density needed to support a streetcar and this isn’t tourist season, the importance of only using weekday numbers in the ridership projections is quite obvious. The numbers used in the report by the AJC clearly don’t paint the entire picture on ridership. Beyond that, those who wrote opinions claiming the streetcar is a failure because of the numbers clearly don’t understand critical aspects of streetcar projects in general, let alone this streetcar project. As this site has addressed, and as Mr. Geisler also stated, a streetcar is designed to spur economic development. This is one of the main reasons streetcars can be better investments than buses when used correctly (please see this great overview of streetcars vs. buses from BeyondDC). We’ve seen this around the country and we’re seeing it here in Atlanta. 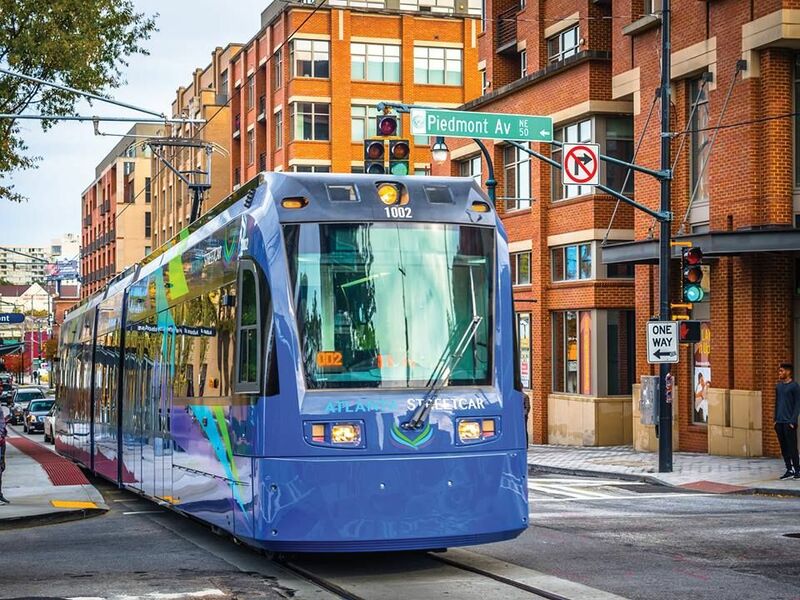 According to Mr. Geisler, the streetcar has already created over $500 million in investments in local neighborhoods over the past 5 years and nearly $700 million more is currently being constructed. Now these are numbers presented by the chief operating officer of the streetcar and we don’t know how much investment would have occurred regardless of the streetcar, but the point is there is more to the streetcar than just ridership numbers. Even with the solid ridership numbers and localized economic development, the project still has a ways to go in spurring economic development. 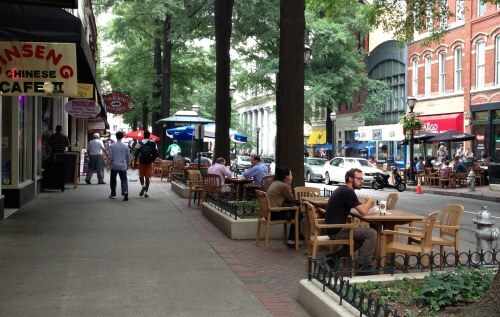 The ATL Urbanist has a couple of good posts looking at the number of open spaces along the route, whether the spaces are simply open lots or parking lots. Both types of open lots don’t cater to streetcar passengers (walkers, or those not relying on automobiles at the time) and that needs to change. Despite the numbers stated by Mr. Geisler and the progress, these open lots still scar the downtown and Historic District areas. The streetcar is supposed to create the incentive to transform a lot from empty or under-utilized to effectively or fully utilized. Parking lots can’t entirely be replaced (our regional transportation network doesn’t allow for that) but we can attempt to create a situation where parking lots are not the best use of the land from an economic standpoint. This would require either enough car-less tourists or local residents to make uses of land other than parking more valuable. Only so many new businesses without parking can open with limited tourists and residents. 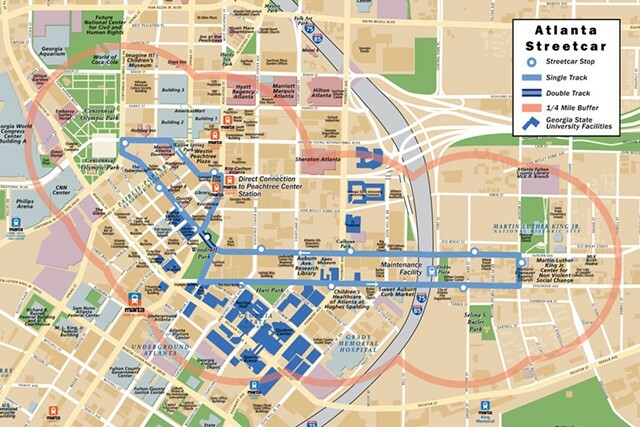 The streetcar runs through a downtown area that is predominantly commercial office space and retail and the King Historic District, which is predominantly single-family houses or small apartment buildings. Certainly much more residential space is going to be required along the line to make parking lots largely undesirable from an economic land use perspective. Downtown office workers and GA State students can use the line, but how often will these people hop on the streetcar to use retail on Edgewood Avenue when they have limited lunch and class breaks? As previously discussed, these groups are really just weekday patrons as well. More residents would create a 7-day opportunity for retail and increase the hours beyond 5 pm. Those students that do reside at Georgia State are likely under 21 so they probably won’t be providing much late-night bar business along the route. More residents, though, could create a bustling late-night scene. Regulations need to change to allow land to be fully utilized in order to realize the benefits. This, however, could be difficult or undesirable given the setting of the streetcar route. The King Historic District is a historic district after all. Without getting into a discussion about the positive and negative aspects of historic preservation, the fact is that development has many more restrictions in such areas. Historic designations are important in preserving the character of the area, but can obviously place some limitations on density and design. Along with the likelihood that increased development in the area likely won’t be welcomed by all, adding new residents may be difficult. New development needs to preserve the character of the neighborhood and needs to provide affordable housing, both of which require time and patience. We need to look at the entire picture before we question the effectiveness of projects. The streetcar actually has solid ridership numbers and is doing a lot to transform neighborhoods and make Atlanta a bit more friendly to residents and tourists. Let’s keep in mind that this project cost about $100 million and just about every other week GDOT comes up with billion dollar highway projects designed to “alleviate” traffic. That $100 million is on course to produce over 10 times the amount in economic investment, which will result in better neighborhoods and a greater tax base. That seems like a pretty good return-on-investment.